Update 2: SEGA has confirmed that eLicense is sending out the claims without their say-so, and that they intend to keep them from doing so any further. Update: Members on our forum are saying that the copyright claims are being removed, even without disputing the claims. So it looks like it’s safe to upload videos with Sonic/SEGA music again. Turns out that copyright laws can stop Sonic after all. 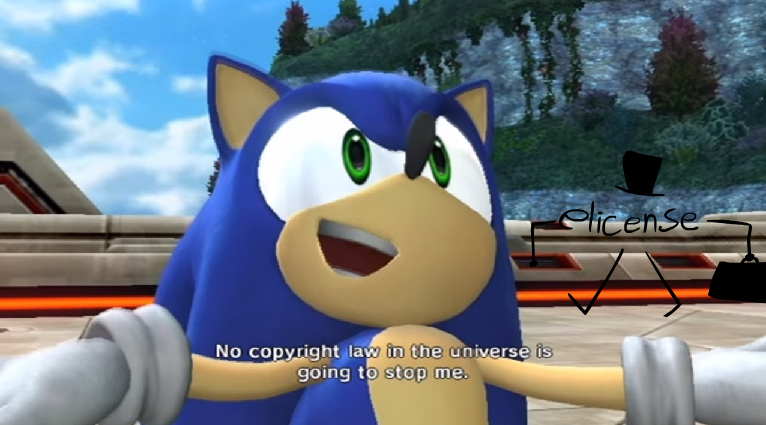 Much to the annoyance of various popular Sonic video creators, a lot of Sonic videos on Youtube have been getting copyright claims because of the music used. This means that the Youtube users who uploaded these videos no longer get ad revenue from them. And this isn’t just affecting Let’s Players like ClementJ642, modders like Dario ff, Melpontro and Paraxade0 have been getting these claims as well for the use of Sonic music in videos showcasing their mods or speedruns. However, we don’t know if these copyright claims actually come from SEGA or not. While it doesn’t look likely that SEGA’s American and European branches are behind this, we haven’t had a confirmation yet if SEGA Japan is behind this or not. The claims are being sent by a Japanese company called elicense, which has a service that specializes in finding copyrighted content on Youtube. And with no clear answer on whether or not SEGA Japan is trying to remove monetization from videos using Sonic music, people are speculating on if elicense is Content ID matching these videos for SEGA. This has also made Youtube users hit by these claims uncertain on if they should dispute them or not. SEGA has put out copyright claims on Youtube videos in their own name in the past though, and elicense is even targeting remixes of SEGA music. Various users have tried to reach out to SEGA on Twitter, but so far they haven’t given a response about this. Jolly Roger has been doing a fantastic job getting stuff from the Sonic X-treme build that was found to work. Most recently he got the level editor used for the game to run on modern Windows and OpenGL, and he has uploaded a video recorded by Andrew75 demonstrating it running on Windows 7. It still needs a lot of work, as it currently has a lot of bugs and crashing issues, but it’s very impressive how fast Jolly managed to get this to work in this state. Be sure to visit the thread about what’s being found in this prototype on our forums, as lots of interesting stuff is being found from this version of the game. It’s very exciting as it looks like we’re getting closer and closer to having a build of the game that runs well on modern computers, especially now that it looks like we’ll be able to make our own levels. You should also check out this recently recorded footage of the OpenGL port of the prototype that Jolly Roger is working on.